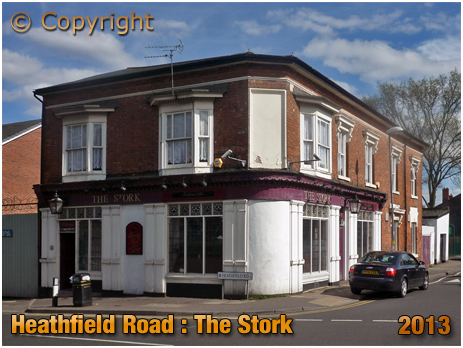 History of The Stork on Heathfield Road at Handsworth in Birmingham in the county of Warwickshire. 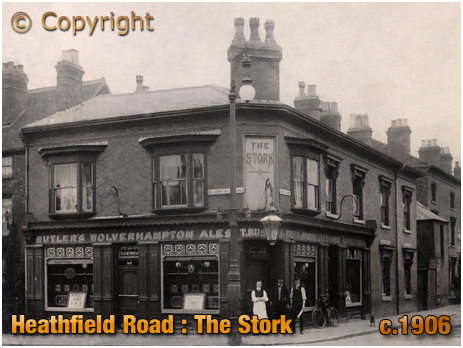 The Stork traded on the corner of Heathfield Road and Finch Road at Handsworth. The last time I went past the building in October 2018 it appeared that the public house was being converted into another use. The pub had been closed for a while so it looked like it was the end of the road for the old boozer. This image is taken from an old postcard of The Stork produced in the mid-Edwardian period. The name above the corner entrance is that of Thomas Bushell. This dates the photograph to around 1906 as the photograph was taken after the advent of the real photo full-image postcard which appeared a little before in 1904-5 and Thomas Bushell died in 1907. He may be featured in the photograph with a barman and perhaps a patron. 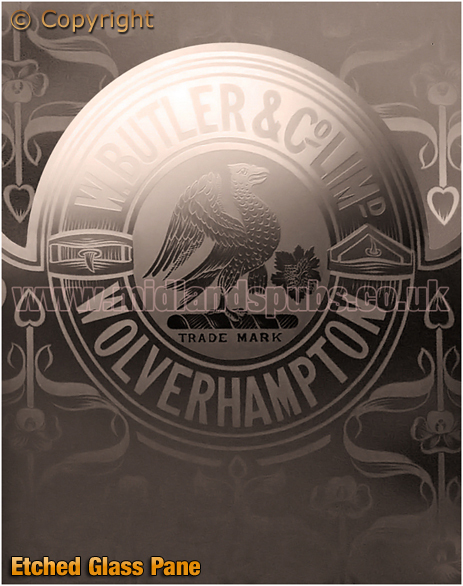 Note that by this time The Stork was operated by William Butler & Co. Ltd. of Wolverhampton. 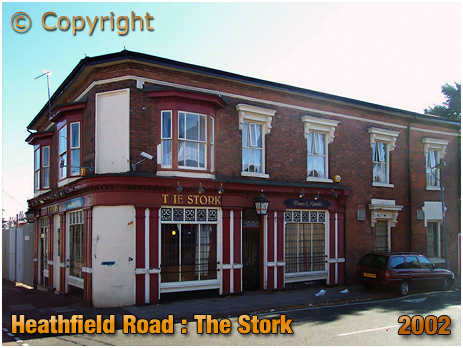 The public house had earlier traded as the Stork Hotel or Stork Inn. The property was originally a beer house. John Ostins tried to obtain a full licence for the Stork Inn. However, he faced a good deal of opposition from local residents when trying to upgrade the premises. In September 1869 John Ostins applied for a full licence, stating that the beer house was his own property and rated at £45. per annum. When addressing the magistrates, his solicitor stated that the "Stork Inn was half a mile from the nearest house." A key reason provided by the legal representative in favour of the granting of the application was that "the omnibuses were in the habit of stopping there." However, the application was opposed by several inhabitants, one of whom was Mr. J. S. Wright, who held teetotal principles. Mr. Snape of The Bench said "it would not affect the decision of the Bench whether a person who opposed was a teetotaller or a drunkard. Mr. Wright was evidently a good specimen of a teetotaller." The above newspaper item in which William Scriven had to publicly apologise to the publican suggests that opposition to his application was rather impassioned, though misguided. The case also raised the question of class and early gentrification of Handsworth during the suburban expansion of Birmingham during Victorian times. At the hearing Mr. G. B. Lowe opposed John Ostins's application on the behalf of a number of the inhabitants of the neighbourhood. The house, he stated, "was not wanted, nor were the residents of the class of people at all likely to support it." He added that: "Placing a public house there would be very analagous to putting a brass knocker on a barn door." He put in a memorial against the application signed by the Rev. H. Peel and a number of the principal inhabitants. Mr. J. S. Wright, as an inhabitant, not as a teetotaller, also opposed the application. He stated that: "They already suffered enough from the house as a beerhouse without the additional infliction of its being turned into a licensed house." The magistrates sympathised with the residents and refused the full licence. The son of a builder and auctioneer, John Ostins hailed from Stourbridge. His grandfather was a maltster and perhaps his mentor in the licensed trade. However, when he first moved to Birmingham he worked as a carpenter and builder. Following the death of his first wife, he married Maria Kerby in February 1863. After running Stork Inn, the couple moved to Farm Street from where John Ostins picked up his career as a carpenter. 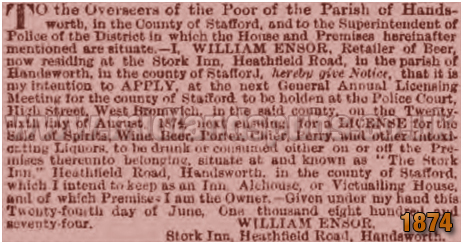 William Ensor also attempted to obtain a full licence for the Stork Inn. The above notice appeared in the Birmingham Daily Post in August 1874. Note that he states he was the owner of the premises. His application, like that of John Ostins before him, was unsuccessful. He was soon on his way and the beer house was taken over by Thomas Bushell. The son of a silversmith was listed in the 1876 Kelly's Directory for Staffordshire as a beer retailer at Heathfield Road. At this time he kept the Stork Inn with his first wife Caroline. The couple, who had four children living on the premises in 1881, were able to employ Henrietta Blohm and Florence Bellamy as servants. Caroline Bushell died in October 1897. Widower Thomas Bushell continued to run the Stork Hotel, as it was then known, with servants Lizzie and Annie Hazeldine. I imagine a few eyebrows in the Bushell family were raised when the publican married the latter who was thirty years younger than him. And there were no doubt further mutterings when he left all his effects to her when he died in May 1907. 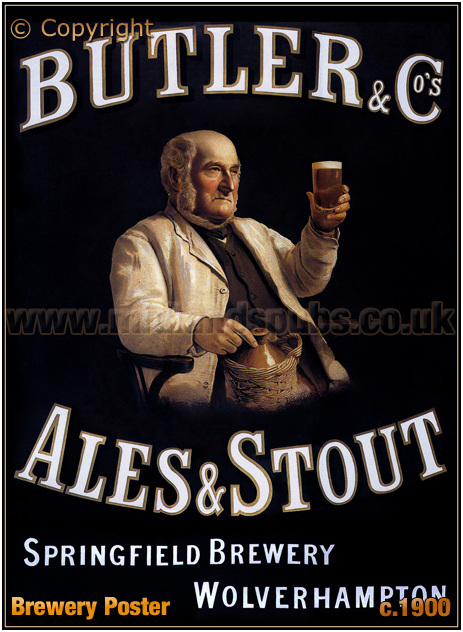 As manageress for William Butler & Co. Ltd., she continued to run the Stork Hotel, along with Eric Bushell, son of Thomas. She also hired George Clarke as a barman and Annie Davis as a general servant. John Perrins followed a similar life route to that of Thomas Bushell. Married, widowed and re-marrying to a much younger woman. And Laura Perrins became the landlady when he passed away in 1917. She remained in charge of the house until the early 1930s. She was succeeded by Mrs. Margaret Metcalf who was granted the licence in November 1932. She remained for 27 years. If you have a genealogy story or query regarding The Stork you can contact me and I will post it here in addition to including your message within the website pages for Birmingham Genealogy. "On Saturday, at the West Bromwich Police Court, before Messrs. J. H. Pearson and P. D. Bennett, Elizabeth Jones , no fixed abode, and Thomas Hinsley , Canal Side, Witton, Aston, labourer, were charged with stealing wearing apparel of the value of 2s., the property of Thomas Edward Bushell, of the Stork Hotel, Heathfield Road, Handsworth. It was alleged that on Wednesday afternoon the prisoners called at the house of the prosecutor and had several jugs of ale. Shortly afterwards the female prisoner went into the back premises, and after she returned some wearing apparel which had been placed in the brewhouse was found in the taproom near where the female prisoner was sitting. Jones denied having put the clothes in the taproom, adding that they were there when she went into the house. The charge against Hinsley wax dismissed, and he was placed in the witness box. He stated that on the day in question the prisoner followed him into the Stork Hotel, and asked him for a drink. Afterwards she went to the back premises, and when she came back he noticed something bulky under her arm. Prisoner was committed to the Sessions for trial, having been previously convicted." "Alleged Theft from a Public House"